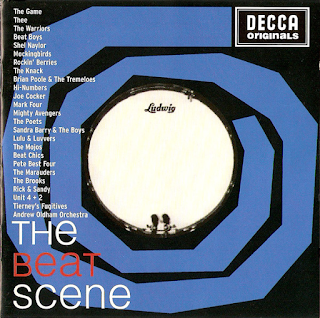 This compilation is part of Decca/Deram's nine CD series of sixties rarities. 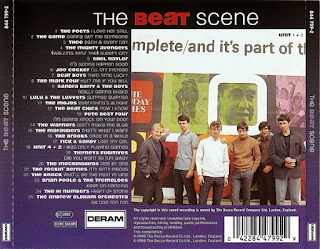 This one concentrates on the mid-sixties boom in Beatles-inspired "beat" pop. Personally, I prefer the blues-orientated ones in the series, but this one is not without its interest. It goes without saying that the sound is superb, as it is on all the releases. "Gonna Get Me Some" by The Game is one of the album's rockiest, solid, thumping numbers. It is less derivative than many of the others, standing strong in its own right. I really like this one. "Each And Every Day" by Thee is actually an obscure early Rolling Stones cover (their version appeared on "Metamorphosis"), as also did "Walking Thru The (Sleepy City)" which also has vague echoes of "Have I The Right" by The Honeycombs. "It's Gonna Happen Soon" by Shel Naylor (who also appears on "The Freakbeat Scene") is very Beatles-influenced. A very young Joe Cocker contributes a lively, rock 'n' roll type number in "I'll Cry Instead". Once again it is so very Beatles in its lively and melodic sound. "Third Time Lucky" by The Beat Boys uses a typical Buddy Holly guitar riff and has a Gerry & The Pacemakers vocal. 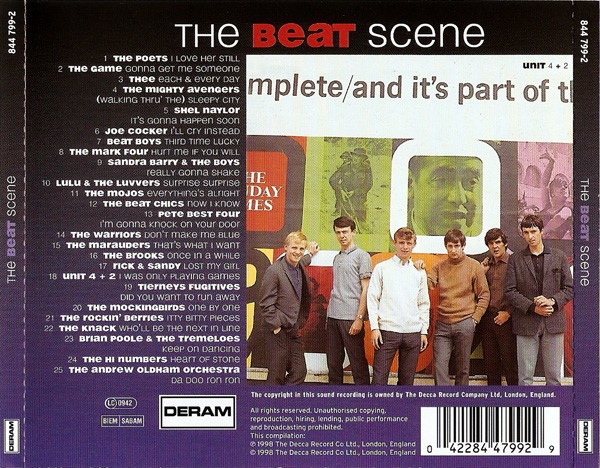 Mark Four was also on "The Freakbeat Scene". Here he delivers the impressive "Hurt Me If You Will". Sandra Barry's "Really Gonna Shake" is a really rocking slice of fun. Lulu uses her impressive voice on the rousing "Surprise Surprise", a Rolling Stones cover. The Mojo's "Everything's Alright" will be familiar with David Bowie fans as he covered it on 1973's "Pin Ups" album. "Now I Know" by The Beat Chics is a delightful piece of gospelly pop. Ex-Beatle Pete Best is on here with "I'm Gonna Knock On Your Door", which was a chart hit for Little Jimmy Osmond later in the early seventies. "Don't Make Me Blue" by The Warriors is so incredibly early Beatles-sounding, it could almost be them. The same applies to "That's What I Want" by The Marauders, complete with "woo-woo" backing vocals. "Once In A While" by The Brooks sounds like something from "A Hard Day's Night" or "With The Beatles". "Itty Bitty Pieces" by The Rockin' Berries owes a lot to The Dave Clark Five's "Bits And Pieces". There is a lot of derivative material on this album, it has to be said. Unit 4 + 2 are known for their hit "Concrete And Clay". Their track here, "I Was Only Playing Games" is a laid-back, melodic number with an "Eleanor Rigby"-style cello. It dates from 1969, way past the main "beat" period. The Hi-Numbers, incidentally, should not be confused with The High Numbers, forerunners of The Who. The Andrew Oldham Orchestra was indeed Rolling Stones producer Andrew Loog Oldham. The Knack are not to be confused with the US new wave band from the late seventies. Their track "Who'll Be The Next In Line" is one of the album's deeper, bluesier rock/pop numbers. Listening to the fast-paced guitar and bass lines you can hear ones used by The Jam on their 1977 debut album. Brian Poole & The Tremeloes' "Keep On Dancing" showed that rock'n'roll was still important in the mid-sixties. Lots of two-way influences to be found as you listen to this interesting cornucopia of rarities.